Only 5 shades though, so this isn’t that kind of party. A couple of years ago I bought a gradient set on a whim with a vague plan about maybe mittens or something. And like so many vague plans, I never got around to figuring out the details and the little skeins sat sadly on my shelf awaiting their destiny. Then all of a sudden I decided the mitten thing was all wrong, they were meant to be a lace triangle. Obviously! 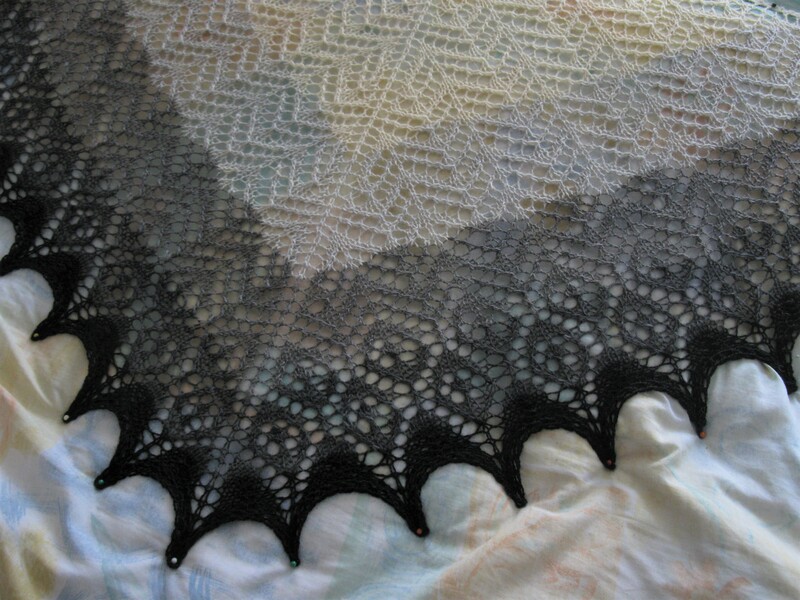 Cast on the zig-zag lace from Knitting Lace Triangles and got through 4 repeats, joining new yarn as I went. Then I started worrying about running out of yarn and did a repeat of the medallion chart, since it has a shorter repeat. Then I looked at the instructions and realized you’re supposed to replace the last four pattern rows with the transition rows to the border. (Pro tip: read the directions first.) 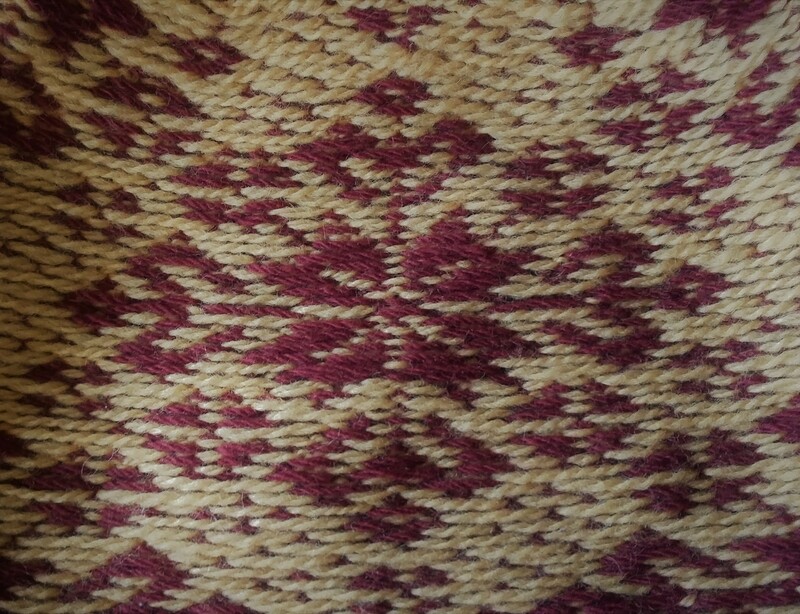 The prospect of tinking back was depressing enough that I decided to go for it and knit another repeat and maybe cut a couple rows out of the border. Wound up playing a rousing game of yarn chicken on the bind off where I had to switch from a stretchy bind off to a plain one on the last few stitches because there was just no way. I don’t think you can tell though. I do so love when I can use alllll the yarn. This is why I keep doing disorganized and slipshod schemes. Sometimes it totally works out! A couple of years ago I got summoned to jury duty and found myself musing about how if I got selected for an actual jury and found myself thinking that any trial would certainly be either horrible (violent crime) or tedious (tax fraud.) 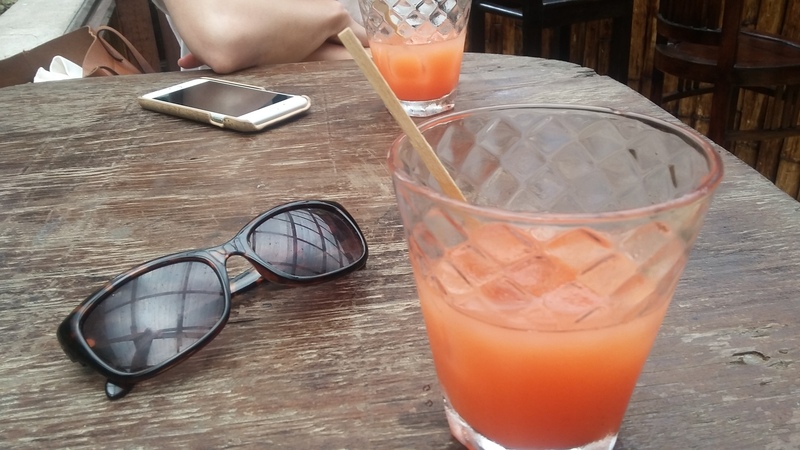 Luckily I ended up getting dismissed after a day without having to be too bored or appalled. But this is why I can never get into true crime. I get how it can be an interesting puzzle, but it just gets me down – I like to keep my murders fictional. I want the witnesses to be musing about that cryptic thing the victim said, not breaking down sobbing. But The Dinosaur Artist by Paige Williams is the kind of true crime I can get behind. It’s not about forensic accounting but also nobody dies (unless we count the dinosaurs, which, it seems fair enough not to.) It’s about Eric Prokopi, who catches the attention of the authorities when illegally selling a Mongolian Tarbosaurus bataar (kinda like a T. Rex) fossil at auction. I’ve never even considered that a dinosaur would be a thing one can buy. Capitalism is wild, y’all! Anyway, it’s a very digressionny book, going off on tangents about Mongolian history, Mary Anning, Roy Chapman Andrews, fossil trade shows, etc. Which is sometimes interesting, and sometimes feels like she’s trying to find a place to fit in all the research she did. So if you’re interested in United States v. One Tyrannosaurus Bataar Skeleton (which is surely in the running for the best court case name ever) and want to brush up on some general paleontology reading this could be the book for you. Y’all! I’ve been off on vacation in St. Lucia. 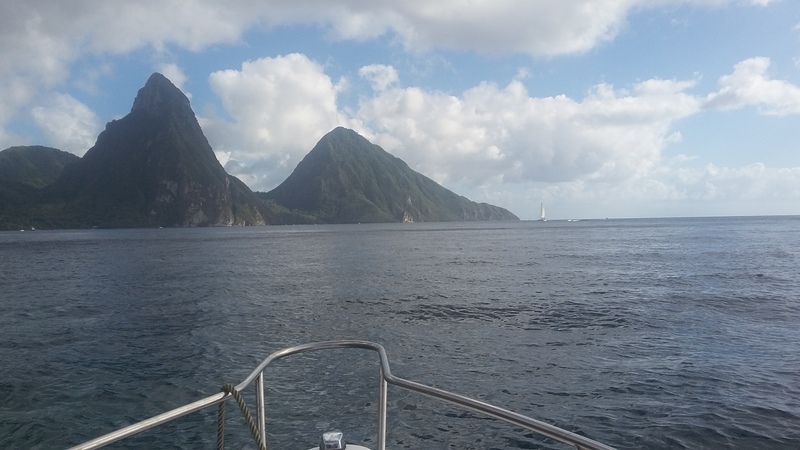 The Pitons and rum punch – this was pretty much my week. I miss it already. I bought a pineapple so I can pretend I’m still in the Caribbean but it’s not quite the same. I sort of thought by the time I got back it might have warmed up a bit here, but the cab driver spent most of the ride home from the airport talking animatedly about all the snow I missed. 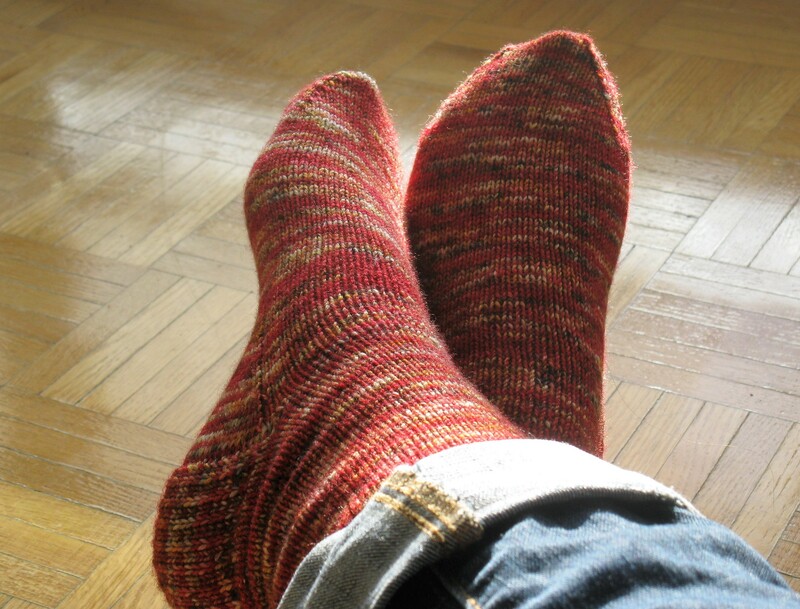 Pattern is Knitting Season; Yarn is from my pile of odds and ends. I’m liking the Gryffindor-esque colours. I dunno if I’d fit in in Gryffindor but they definitely have the best house colours. Rowling was so biased. 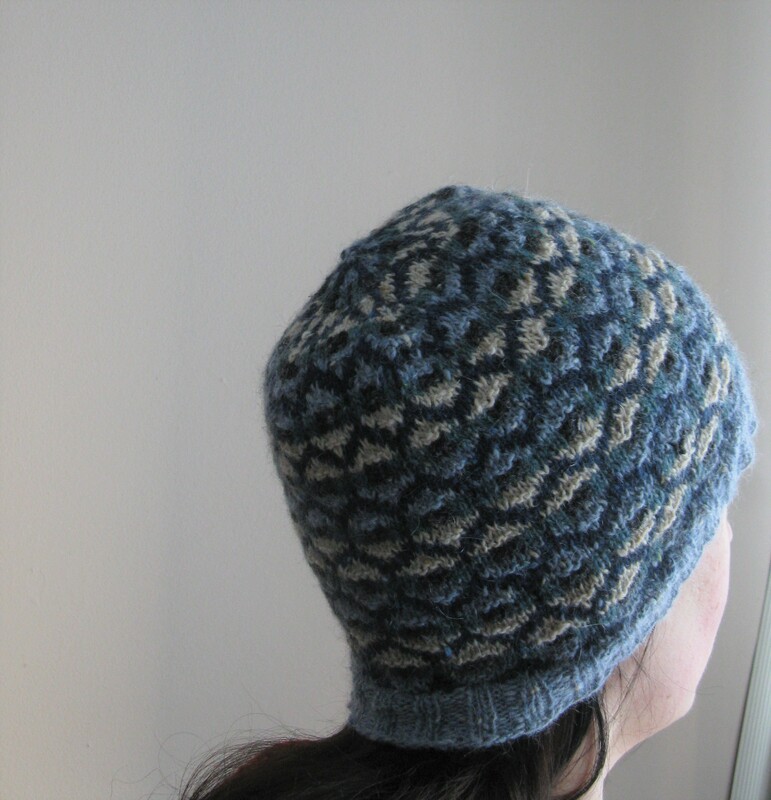 But my goal is to wind up with a hat, and not a knitted torture device or on of those fatally flawed projects that looks pretty but never gets used. At least those worked out. 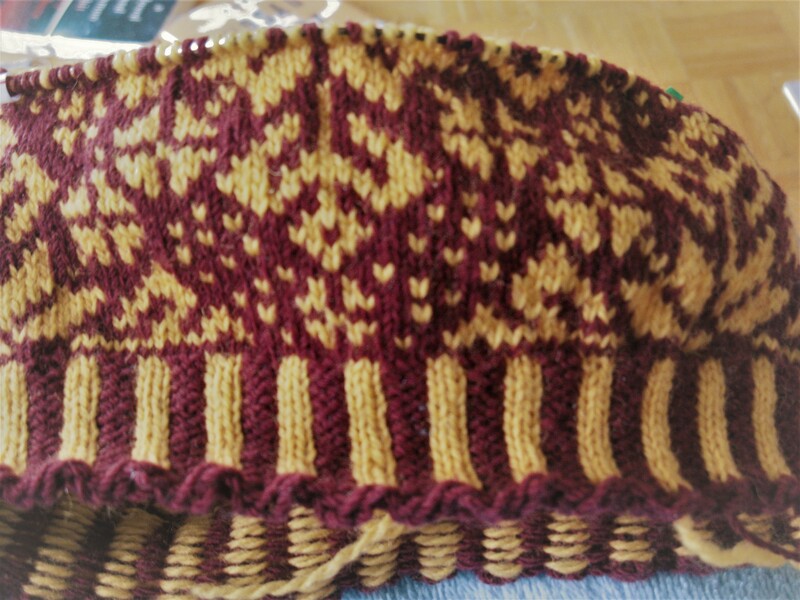 Now I’m back in hat land, having cast on a few extra stitches at the brim. It’s not a race or anything, but whenever I have to rip back I’m never quite content till I get back to the point I was at. So on the bright side I’m making good progress. On the downside, if the brim is too loose now I’ll have no choice but to set the thing on fire in a fit of rage. Maybe I should go check the batteries in the smoke detector? The last couple of weeks I’ve had one of those nasty lingering colds. Now that I’m finally shaking it, it seems I’ve lost several days somewhere. The month is nearly over? The milk has expired? I can’t seem to understand how this has happened. 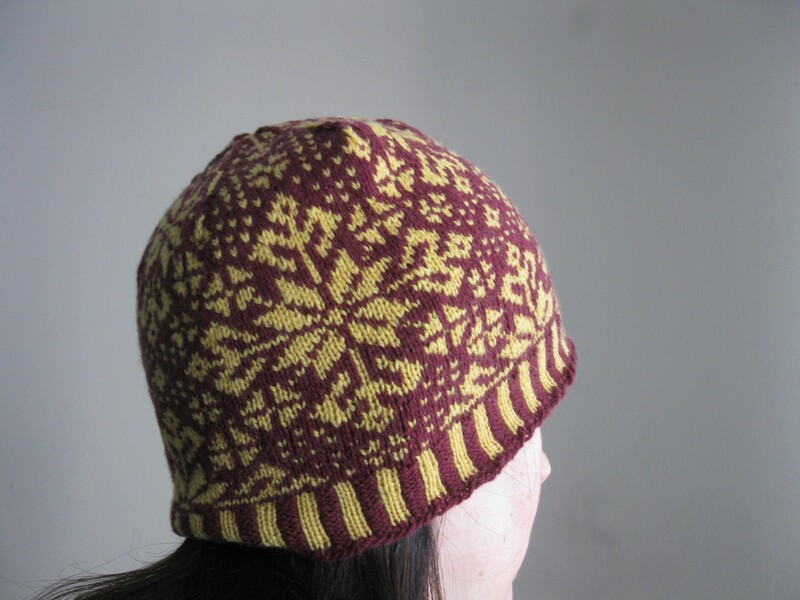 Pattern is Craigallian Hat in the original Milarrochy Tweed. I used the winter colours because, well, it’s winter. I’m creative like that. I knit an extra repeat so it covers my ears better, seeing as it’s winter. 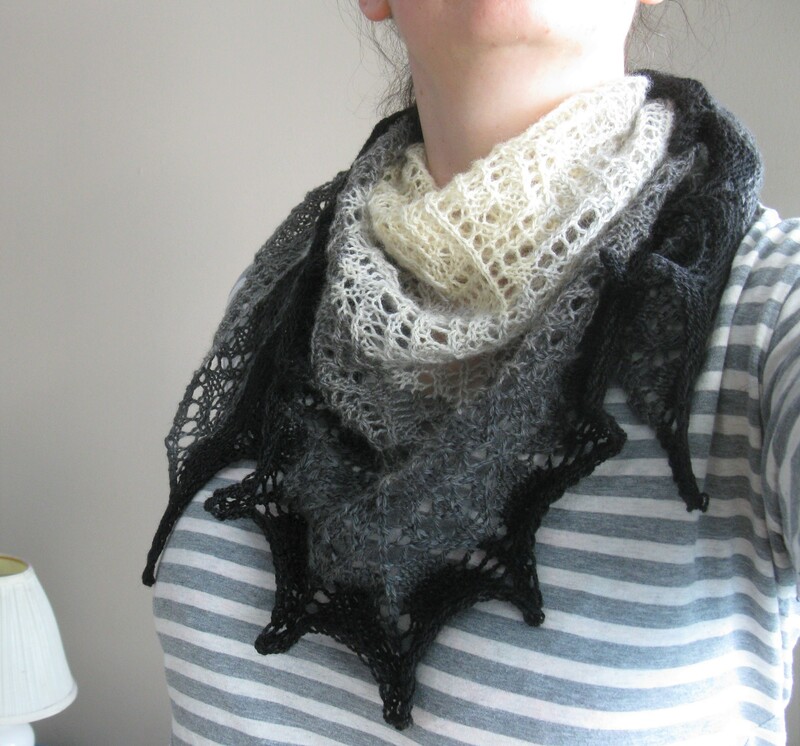 The thick and thin nature of the yarn isn’t my favourite but it did start to grow on me. 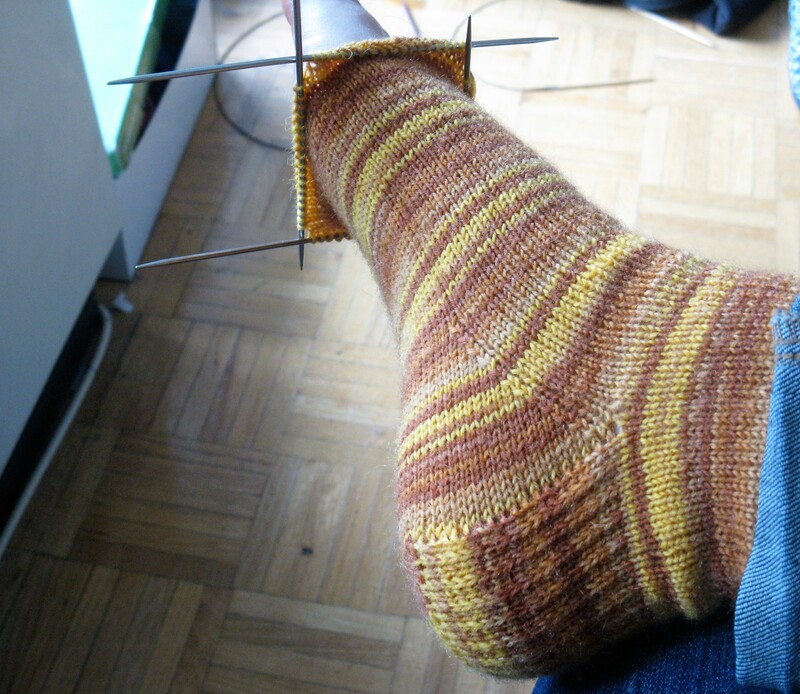 As always when I knit stranded patterns, I can’t remember why I don’t knit more. It’s so gratifying watching the pattern emerge. I’m thinking of starting on another hat. A bit of red should liven things up and clear out my sinuses, right? Happy New Year Y’all! I like to think of a shiny New Year full of shiny new possibilities but I’m still musing about my last book of 2018. Despite the title, The Long Way to a Small, Angry Planet by Becky Chambers is about mostly really nice people. (Some of whom are aliens. Aliens are people too!) It starts out when a young woman with a secret past joins the crew of a wormhole building space ship as a clerk. And they’re (almost) all so nice and welcoming. Then they get a big job a long way off, some things happen along the way, and everyone mostly at least tries to be polite. They’re all so nice! More and more I find myself appreciating stories about nice people doing their best. Even the universe here is so nice. Some Bad Things have happened to Earth but the book isn’t really about that; it’s sad but they don’t live there. So much Science Fiction always seems so bleak and dystopian with oppressive governments, killer robots, nuclear winter, civil war, etc. It’s so nice here that the universe has so many planets to visit and cool things to see. And yet, I find myself wishing there was a bit more here. There aren’t a lot of stakes for most of the book. The structure almost feels like a TV series where each episode they stop on a new planet/encounter space pirates/meet someone unexpected, stuff happens, then everything kind of goes back to the status quo. Much as I appreciate a nice story about nice people in space, what I could really go for is a nice story about nice people overcoming obstacles in space. Then I feel mean for wishing harm on the characters. Did I mention how nice everyone is? Lately it seems like approximately 90% of all literature is about the Holocaust, or perhaps a different war, or maybe slavery. Y’know, serious depressing stuff. That’s how you know it’s litterchure! I saw a comment somewhere where someone was saying she liked reading romances because they had happy endings and no gruesome deaths. I don’t read romance but I see her point. Also, it’s set in Toronto, which gives me that constant thrill of “Hey, I’ve been there!” I wonder if people who live in places like New York or London get bored of seeing their city in fiction. Maybe I can wear them for treasure hunting.